One more recipe in my series on Cooking for the New Mom. 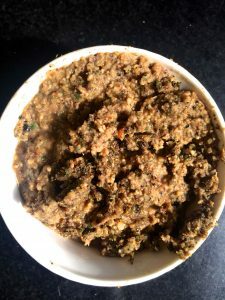 This one is a simple Pathiya Peerkangai Thogayal or chutney, with ingredients suitable for a healthy balanced diet (pathiya samayal) during the 40 days immediately after delivery. 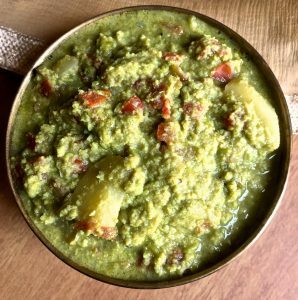 In a traditional Tamil style Peerkangai Thogayal or Turai/ Ridge Gourd Peel chutney, red chillies and tuvar dhal would be added. However as both these are not advisable for a new mother, peppercorns and moong dhal (passi paruppu) are substituted. When properly made, the Pathiya Peerkangai Thogayal is both tasty and nutritious. Do check my post for Menu Ideas and for what goes into a Balanced Meal for the first 40 days after child birth, as well as Recipes for this diet in Cooking for the New Mom or Pathiya Samayal, my way. 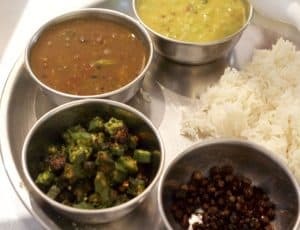 Cooking without adding onions, chillies, coconut etc and from only a small selection of vegetables considered healthy for this diet, is not easy, so I have tried to capture my experience in cooking for my daughters, in that post. 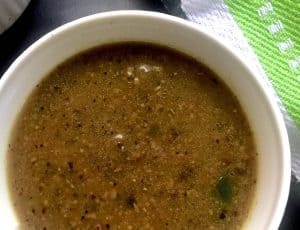 Check here for the recipe for a Peerkangai Thogayal or Thurai Chutney for a normal diet. 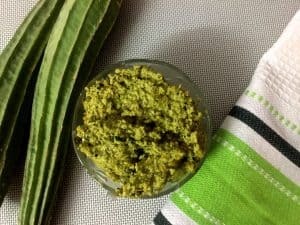 In this recipe for Pathiya Peerkangai Thogayal, I have included a plant that is not commonly known in modern cooking though it was a traditional staple in many parts of India and has been known for its medicinal properties since ancient times. This is the Bone setter Plant or Pirandai (Tamil), also called the Adamant creeper or Devil’s Back Bone in English, and as Hadjot in Hindi, Mangaravalli in Kannada. From what I can see online, the Bone setter plant is nor generally seen in urban markets, but is found in vegetable shops as well as in kitchen gardens in rural Tamilnadu as well as in some places in Chennai and other cities. It should be available in other parts of the country too, as the plant is very sturdy and tenuous, does not require much maintenance. I had known about the plant and its properties, specially its use since ancient times for healing fractures and injuries of the bone, much earlier and had forgotten all about it, until my cousin Srimathi (Seetha Anandam Vaidyam) gave me a cutting to plant at home at Hyderabad, saying it would be good to add to my daughter’s diet after her delivery. 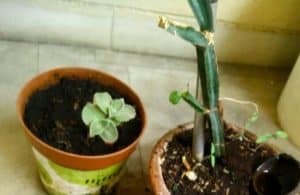 The simplest use of the plant is to snap off a piece of the tender stem and add it to the Pathiya Peerkangai Thogayal that I am describing in this post. Do you see this cactusy looking plant to the right in the pic below? Thats the pirandai, curtsey Seetha, merrily growing in Mridula’s balcony at Hyderabad. The Pirandai plant has numerous health benefits, however it is a medicinal plant and hence its consumption should be in moderation and should and with due information as to the effects of adding this plant to the diet. Select only the new tender growth of stem. The stem grows at nodes, and the first two such digits are the most tender. The rest of the stem is more mature and can cause itchiness during handling. Sesame oil applied to the hands before plucking and while preparing it for the Pathiya Peerkangai Thogayal, would help avoid any itching. I have not personally faced this problem but as several articles online mention this, it is best to take this precaution. If using some of the older and tougher parts of the stem, wash the stems and peel away the sharp edges from top down. Add curry leaves and turmeric to the stem slices while sautéing, as in the recipe below, to get the best out of the stem and to avoid any possible itching. As the Perandai plant is not readily accessible in most places, the addition of the stem to this recipe is optional. The proportions of the remaining ingredients need not change if you are omitting the bonesetter from the recipe. As I could not lay hands on it in Bangalore, I have made the version in the pictures below, without the perandai stem. This is an easy sautéed Brinjal Curry with Capsicum, quick to make, and for me, comfort food. Take it with roti or rice and dal or rasam, or morekuzhambu, or like I do, sandwich it between two slices of bread and a tasty cheese and grill it. I make this Brinjal Curry with Capsicum about once a week, when I get the long purple Nasu’ Japanese brinjal supplied by First Agro Farms at Bangalore. They slice so beautifully and cook very fast. Knowing that I have sourced Safe food which is zero pesticide and non GMO gives that ‘feel good’ satisfaction! Eggplant is the common name in North America and Australia, but British English uses the French word aubergine. It is known in South Asia, Southeast Asia and South Africa as brinjal, melongene (Caribbean), and formerly melongena and mad-apple. 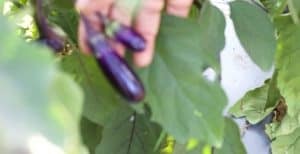 In 13th century Italian traditional folklore, it was said that the eggplant can cause insanity.In 19th century Egypt, it was said that insanity was “more common and more violent” when the eggplant is in season in the summer. Its relationship with the nightshades let the earlier beliefs that it was poisonous. Wikipedia goes on to say that the flowers and leaves can be poisonous if consumed in large quantities due to the presence of solanine. Related to the tomato – I can understand, but related to the potato and the tobacco plant? That’s surprising! Some further reading showed me that the brinjal actually contains nicotine, however in negligible quantities of 0.01mg/100g. The culinary uses of the brinjal are varied depending on the region, though it is an ingredient in many cuisines: Stewed as in the French ratatouille, deep fried in parmigiana di melanzane in Italy, or in mousaka in Greece, the Middle East and South Asia and karmyarik in Turkey. A delicious dish when dipped in batter and deep fried and served with a tahini and tamarind sauce. Wikipedia says that in Iranian cuisine, it is blended with whey as kashk e bademjan, tomatoes as mirza ghassemi or made into stew as khoresh-e-bademjan. It can be sliced and deep-fried, then served with plain yogurt (optionally topped with a tomato and garlic sauce), such as in the Turkish dish patlıcan kızartması (meaning fried aubergines), or without yogurt, as in patlıcan şakşuka. Perhaps the best-known Turkish eggplant dishes are imam bayıldı (vegetarian) and karnıyarık (with minced meat). Roasted in its skin until charred, so the pulp can be removed and blended with other ingredients, such as lemon, tahini, and garlic, as in the Arab baba ghanoush and the similar Greek melitzanosalata. A mix of roasted eggplant, roasted red peppers, chopped onions, tomatoes, mushrooms, carrots, celery and spices is called zacuscă in Romania , and ajvar or pinjur in the Balkans. A Spanish dish called escalivada in Catalonia calls for strips of roasted aubergine, sweet pepper, onion and tomato. In Andalusia, eggplant is mostly cooked thinly sliced, deep fried in olive oil and served hot with honey (“Berenjenas a la Cordobesa”). In the La Mancha region of central Spain (Don Quixote land!) a small eggplant is pickled in vinegar, paprika, olive oil and red peppers. The result is berenjena de Almagro, Ciudad Real. A Levantine specialty is Makdous, another pickling of eggplants, stuffed with red peppers and walnuts in olive oil. Eggplant can be hollowed out and stuffed with meat, rice, or other fillings, and then baked. In the Caucasus, for example, it is fried and stuffed with walnut paste to make nigvziani badrijani. 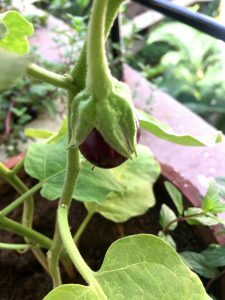 The brinjal is used in Indian cuisine in a variety of ways – cooked in sambar, a tamarind lentil stew in the South; in dalma in Odisha, in chutney or pickles. 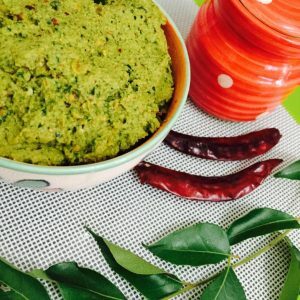 It is truly delicious when roasted, skinned mashed and cooked with onion and tomatoes into baigan bharta or a gojju, similar to the salata de vinete in Romania and begun pora in Bangladesh, Odisha and West Bengal in India, where the pulp of the vegetable is mixed with raw chopped shallot, green chilies, salt, fresh coriander and mustard oil. Sometimes fried tomatoes and deep-fried potatoes are also added, creating a dish called begun bhorta. In a dish called bharli vangi, brinjal is stuffed with ground coconut, peanuts, and masala (spices), and then cooked in oil. Or stuffed with spices and deep fried. Or just, made into a delicious Brinjal Curry with Capsicum as in the recipe below. When you slice the brinjal or eggplant and leave it untended for a shortwhile, the flesh begins to brown. This is caused by the oxidation of polyphenols, such as the phenolic compound in the brinjal, viz, chlorogenic acid. When slicing brinjal for Brinjal Curry with Capsicum, I sprinkle salt and turmeric powder immediately on the slices. The salt draws out some of the bitterness inherent in the eggplant while the turmeric not only marinates the slices but prevents them from turning black. I also also use a stainless steel knife to slice the eggplant, as I have read that stainless steel does not react with the phytochemicals in the fruit which may otherwise turn black. 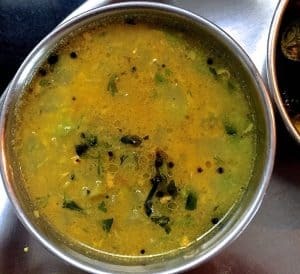 I use Olive oil for making Brinjal Curry with Capsicum and sometimes Sunflower oil, rather than any oil with a strong personality which may overpower the taste of the brinjal. The brinjal or baingan is often thought of as ‘bae -gun’ or without any good aspects, ie nutritional benefits. This is a misconception, as a quick search online can show. The taste of the brinjal curry and the nutrition, is enhanced by adding slices of tomato and capsicum or different coloured peppers. Fresh green peas taste good in the brinjal curry with capsicum too. The trick to tasty fried brinjal curry is to really sauté it well, stirring frequently, on a low flame. It is low in calories and fats and carbohydrates and has good soluble fibre content. It does not have much of dietary fibre though. It has been used to control cholesterol. It has been used along with other vegetables to control diabetes and hypertension. The Brinjal or eggplant has Vitamin C and some levels of many essential B-complex groups of vitamins – which are obtained only from external sources and used by the body cells for the metabolism of fat, protein and carbohydrates – such as pantothenic acid (vitamin B5), pyridoxine (vitamin B6) and thiamin (vitamin B1), niacin (B3). The brinjal also contains minerals such as manganese (moderate levels), copper, iron and potassium (low levels). The colour of purple skin varieties is due to the anthocyanin nasunin, and anti-oxidants that have potential health effects against cancer, ageing, inflammation, and neurological diseases. On then to my simple and delicious Brinjal Curry with Capsicum, tomato and fresh peas! This was a staple for dinner or lunch during long train journeys. 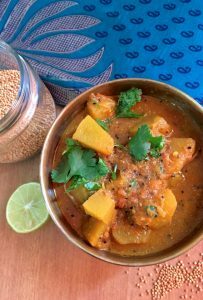 Mom would make this quick curry with potato cut small and fried in a little oil, with just chilli powder, turmeric and salt. We would eat it rolled up in chappatties, and washed down with chai in a matka: I can’t describe how tasty it was! I’ve made my own favourite version adding poppy seeds and kalonji , served with rice and masoor dhal….